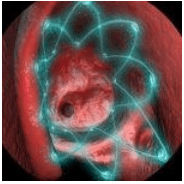 Functional Endoscopic Sinus Surgery is a minimally invasive procedure used when moderate to severe sinusitis is no longer responding to conservative treatment methods. During the procedure, Dr. Davis utilizes an endoscope (which includes a light and camera) to navigate through your sinus cavities to remove the bone or tissues preventing your sinuses from draining properly while you are under general anesthesia. The surgery usually takes approximately one- to three-hours to restore proper sinus ventilation and function, and you can go home the same day, as Functional Endoscopic Sinus Surgery is considered an outpatient procedure. 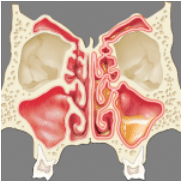 When you suffer from chronic sinusitis, mucus becomes trapped in the compartments of your sinuses (left side). Functional Endoscopic Sinus Surgery removes the small bony partitions, creating larger drainage pathways (right side). Where Are My Sinuses Located? You have five major sinuses on each side of your face. The sphenoid sinuses are the large sinus cavities located behind the eyes (almost between the ears). 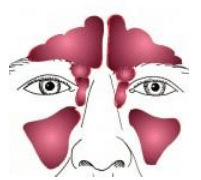 The optic nerve (which supplies vision from the retina), the internal carotid artery (which supplies blood to the brain), and the pituitary gland (which controls growth, the thyroid, and the reproductive system) are all situated within or along the sphenoid sinus. Many patients who experience this type of sinus infection describe the pain as coming from their head, especially in the back of their head. Therefore, it is vital to seek medical attention if you begin to experience symptoms of a sinus infection, particularly a headache. 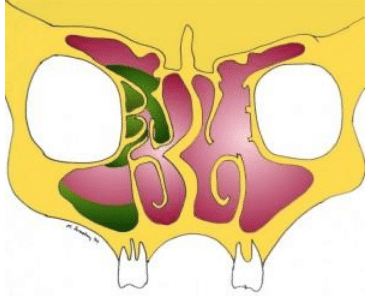 The ethmoid sinus is more like a honeycomb than a cavity, and contains multiple small air pockets separated by paper thin bone. Located directly between the eye sockets, the ethmoids extend up to the base of the frontal lobe of the brain. During sinus surgery, Dr. Davis divides the ethmoid cavity into an anterior portion (which drains in front of and beneath the middle turbinate) and a posterior portion (which drains behind the middle turbinate). Will I Have Pain and Nasal Packing? Since the bones dividing the ethmoid sinuses are as thin as a robin’s eggshell, sinus surgery results in surprisingly little pain for most patients. Many times, Dr. Davis’s patients are only in need of prescription pain medication for the first few days (usually less than 5 days). 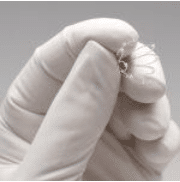 The need for nasal packing is dependent upon the severity of bleeding during sinus surgery. For most surgeries, Dr. Davis is able to avoid nasal packing altogether. However, you should be prepared for the possibility of difficulty breathing through the nose for the first week after surgery. Major complications from sinus surgery are exceedingly rare. However, sinus surgery involves the removal of bone and/or tissues that are located very close to brain and in-between the eyes. Therefore, injuries to the brain, spinal fluid leakage, meningitis, blindness, double vision, and loss of smell have all been described after endoscopic sinus surgery. In addition, general anesthesia alone can cause serious complications, including stroke, heart attack, tooth injury, voice injury, and death. Again, these risks are serious but rare – as are the risks of driving an automobile. Because of the potential side effects of sinus surgery, it is critical to choose a surgeon who is certified by the American Board of Otolaryngology – Head and Neck Surgery, as well as who has great training and experience with endoscopic sinus surgery. After any general anesthetic, you should go home and rest for the remainder of the day. Do not make any important decisions or drive a car for at least 24 hours after taking prescription pain relievers. Keep your head elevated to reduce swelling. In addition, warm, moist air can be soothing after the procedure. Crusts/blood clots will usually accumulate in the sinus cavities after sinus surgery. These can cause residual infections and scarring that leads to further sinus trouble. However, irrigating with sterile salt water (saline) will help you to keep your nose clean. It is important to remember to not blow your nose for at least two weeks. Your surgeon will want to examine your nose in the office within a week after endoscopic sinus surgery, and may spend some time and effort cleaning your nose. Several such visits may be required, depending on the health of your nose at follow-up. Unlike most types of surgery, the professional fees for sinus surgery do not include postoperative endoscopy and cleaning. Therefore, depending on your insurance, you may need referrals for these visits and should expect to be billed separately from the main surgery. DRESSING: Light red to clear drainage from the nose is normal for 3-5 days following surgery. The outside gauze dressing may be removed or changed when soiled or saturated. A 2×2 gauze pad folded under the nostrils and held in place with a strip of paper tape or folded surgical mask is sufficient. 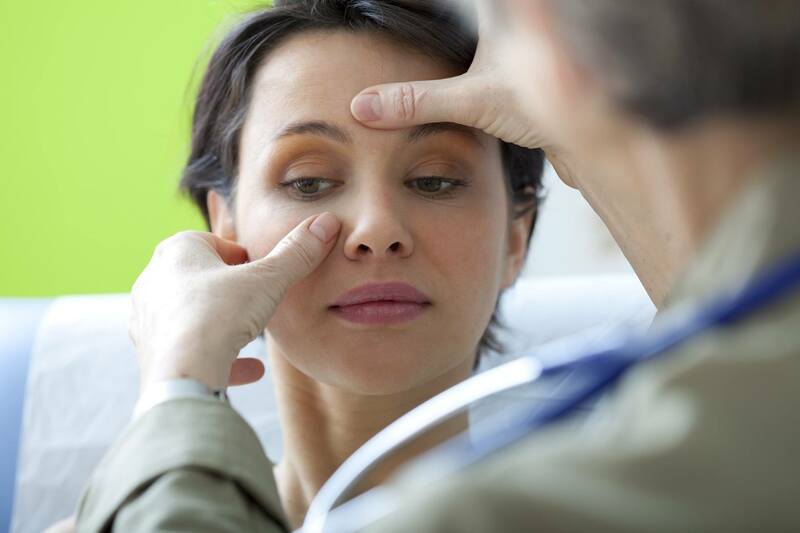 MEDICATION: Headache, sinus, or nasal discomfort is common after surgery. You should have pain medication prescribed by your surgeon to help alleviate pain. An antibiotic, steroids, and a nausea medication may also be prescribed. SALINE IRRIGATIONS: You should flush out your nose with 8-ounces of saline solution at least 4-6 times daily to remove old blood and secretions, reduce crusting, keep sinus openings clear, and stimulate the natural mucous flow in the nose. Dr. Davis recommends the “Sinus Rinse” squeeze bottle. Pre-made saline packets can be purchased at your local pharmacy. Please use distilled or boiled water only. ACTIVITY: No strenuous activities or lifting should be attempted for at least 14 days after surgery, as this might increase your risk bleeding. Do not blow your nose for 2 weeks after sinus surgery. EAT AND DRINK NORMALLY: Avoid alcoholic beverages and tobacco. Double or blurred vision. Decreased ability to move or close eyes or eye pain. PROPEL is the first and only product in sinus surgery clinically proven with Level 1-A evidence to maintain surgical results.